It was a nice sunny day in Buenos Aires, but a little cold for the season since it is still summer here down under. I told many friends the night before that I was expecting the Pope to be elected on the 13th since that day of the month was chosen by Our Blessed Mother to crown the first twelve days of prayer. Mary, Mystical Rose, Queen of Priests is remembered that day every month of the year. The sight of a puff of white smoke coming from the Sistine Chapel’s chimney confirmed my hunch and then came the great surprise: our own Archbishop of Buenos Aires had been whisked away by the Romans and was now Pope Francis. The name selected matches the man perfectly. He is a priest of austere habits. By now you know what most of us knew here: he cooks his own meals and lives by himself, without the small army of service personnel that assists most bishops around the world. So, in that sense he is very Franciscan, although he is also a Jesuit soldier of the old school of St. Ignatius Loyola. It is impossible for a good and saintly Jesuit not to see the faith as soldiering for Christ. I don’t want to repeat what everyone is saying about this man’s virtues. I will stress though that he is a man’s man in the old way of Argentines of happier times, before vice and corruption came to us disguised as a promise that government was going to take care of us all as long as we worshiped the golden calf. To be a man in this periphery of the world can take someone to unexpected places. When leading the Argentine Jesuits, Monsignor Bergoglio found himself in front of Jorge Rafael Videla pleading for the life of two fellow Jesuits with leftist political leanings. That may seem merely a kind gesture to you but it was more than that. Bergoglio risked his life and went between the jaws of the lion to retrieve these two men whom he himself had severely disciplined shortly before they “disappeared” into the regime’s dungeons. That act remained hidden from view for a few decades. He was even accused by some in the leftist media of aiding the actions of the dictatorship, and only after being forced to declare before a tribunal did his intervention on behalf of the two Jesuits become public knowledge. No one has heard an apology from his accusers yet, but such is the fate of the saints. 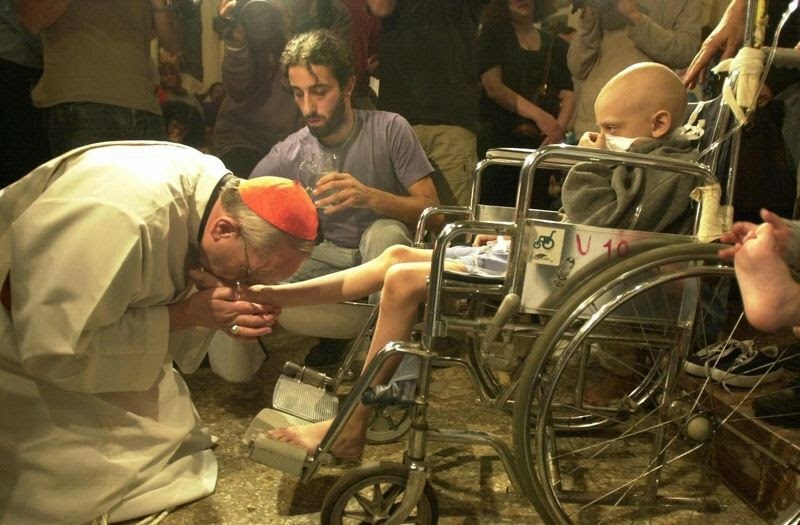 So when Bergoglio extended charity and concrete help to the youngest victims of the AIDS epidemic and kissed some of them tenderly, that was not meant to be a gesture for media consumption, it was a way to teach his flock by example. Francis is, in that sense, like the old Francis who used to preach by means of taking a walk through a village in his tattered habit and worn out sandals, preaching without saying a word: he was a walking page of the Gospel. 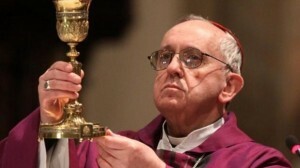 Jesus said, “He who has seen me has seen the Father.” In the same manner, he who has seen Francis has seen Jesus and he who has carefully observed Bergoglio has seen the future of the Catholic priesthood as intended by God: a way of self-denial, modesty, measured words and manly virtues valiantly exercised in charity. It was the feast of Our Lady of Lourdes when our beloved Benedict announced to the world that he was leaving vacant the throne of Peter. This is a very significant date. Remember the specific place where Our Lady appeared in Lourdes: a cave that was occasionally used as a pigsty. From there flowed a miraculous clean spring of water. The main purpose of that Marian apparition was healing but it started in a truly unclean place. So the message is not only one of healing, but of transformation. When the Conclave elected Francis on March 13th, that date suggested strongly that one of the main missions of the pontificate of Francis is going to be the healing of the Catholic priesthood. Just as Our Lady converted that pigsty into a beautiful edifice dedicated to the glory of God, expect Pope Francis to work with Mary to reconsecrate the Catholic priesthood at all levels after a thorough house cleaning. It takes a good man, a manly man to sit on the throne of Peter these days. John Paul II, Benedict XVI and now Francis fit the bill. Just like Peter, expect Francis to be more often fixing the broken nets than handling the helm. Remember that he is a walking homily directed particularly to us Catholic men and more specifically to those of us who have been chosen to live the priesthood as a sacrifice to the living God. Benedict asked us to pray that he would not flee for fear of the wolves. He did not flee but he may have found that a strategic retreat was better for the Church. He did not do that out of fear or cowardice. On the contrary it was an act of valiant humility that opened the door for this Jorge Bergoglio, named after St. George the dragon slayer, to lead the fight with renewed energy. As thoroughly proved years ago when he appeared before Videla, Francis is no coward. One has to be a man with total self-control to kiss a leper or face a man that can easily order one’s own death. That is a union of soldiering with charity that is not easy to achieve without serious divine help. Such is the Pope that God gave us. Glory to Him for not giving us the pope we deserve. I have read your commentaries here before, and I highly respect your words. I have even tried to read your blog, but my Spanish is too rusty. Thank you for this essay, too. I have read conflicting reports about his support or suppression of the Latin Mass in Buenos Aires. Can you give us your observations and opinions? There are many who are critical of Archbishop Bergoglio. I have found all those accusations baseless every time I investigate. It is a mystery to me why so many people in Argentina hate his guts. To say it succinctly if the left and the right both hate him, he must be doing something right. The same thing happened to Jesus. I remember 1978 when some said that the Church had a “Communist Pope”, There was absolutely no reason to think that but some assumed that Poland was a communist country and therefore he had to be a communist! You know how the story went. Going back to Francis: he is well aware that Latin America has been ruled by a nearly continuous line of incompetent clowns since the days of Bolivar. I have the hunch that Francis will give to the Latin American “club” the same treatment that John Paul gave to the Soviet “club”. I can tell you they are already shivering. The Tridentine Mass was implemented in Buenos Aires only 48 hours after Pope Benedict’s Motu Proprio was known. Cardinal Bergoglio was obedient and humble as usual. Those who accuse him of dragging his feet are simply lying. Bergoglio’s life is an open book. That appears in stark contrast with those who accuse him from the shadows. There are many journalists today here in Buenos Aires trying to dig up dirt on Francis and some of them are Catholic. All I can say to you is get you magnifying glass and look carefully, study the life of this man and you will be moved by his exemplary conduct. He is a man’s man and a priest’s priest. The Lord has given us something who can really meet the challenge. Soon you shall see the mettle the man is made of. Thank you! That was my impression, but I needed confirmation from someone I could trust. I read here about “healing the Catholic priesthood”. How sick is it? What is wrong with it?